Get inside and lock your doors. Close your windows. There's something in the fog. 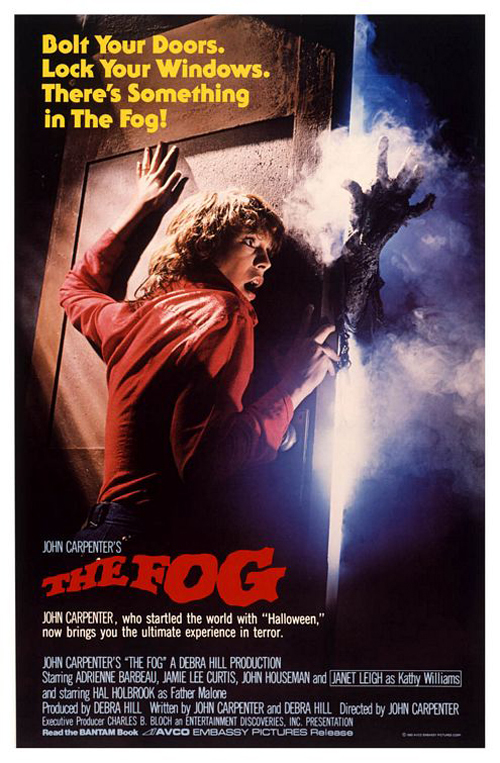 (SPOILERS) The Fog has its fans, but I tend to concur with Carpenter’s acknowledgement of the movie’s issues; it represents his first serious stumble, lacking both the sure, driving pace of his previous horror classic and its sense of humour (despite a surfeit of in-jokes, mostly on the character name front). It’s a short movie, but one that never really hits its stride. What The Fog undoubtedly has going for it is superb, highly memorable and evocative photography from Dean Cundey (it’s no coincidence that, when he stopped working with the director, the latter’s days delivering the goods were numbered) and a memorable cast. Although, in the latter regard, it’s telling that there are far fewer distinguished players in the much more effective, structural near-remake of the overtly Lovecraftian Prince of Darkness seven years later. The Fog opens with considerable panache, however. Following a title card quoting Poe (“Is all that we see or seem but a dream within a dream?”), John Houseman delivers a classic “It was a cold and stormy night” tale, scaring the bejesus out of a bunch of kids with a tale of the undead crew of clipper ship the Elizabeth Dane, and how, “when the fog returns, they search for the campfire that led to their icy death”. It was one of a number of scenes added during reshoots, as Carpenter was extremely unhappy with the initial cut (the quote came from Deborah Hill, a Poe fan, the fog itself from a trip they took to Stonehenge when the stuff rolled in, and the grue from Carpenter’s affection for EC Comics). Having decided “This doesn’t work” he added more “mood, fear”, ghosts and several extra shock sequences, including Elizabeth (Jamie Lee Curtis) in the morgue with the resurrected corpse and Stevie (Adrienne Barbeau) on the roof of the lighthouse being menaced by maggoty mariners. There are definitely some uber-cheesy jump scares in the picture, but the biggest problem is that Carpenter fails to imbue a sense of building dread. Individual scenes ascribe an appropriate air of ancient evil returning, such as Hal Holbrook’s Father Malone (originally earmarked for an unavailable Christopher Lee) discovering his grandfather’s diary in the church and its confession of terrible crimes against the crew of the Dane (Doctor Who’s The Curse of Fenric would plunder a number of elements from Carpenter’s film, not least the discovery of an important piece of the puzzle in a church wall), but there are long stretches were the anticipation of climactic events fails to weave a spell (it isn’t clear to me exactly why Malone tells Janet Leigh’s mayor Kathy Williams about his find, other than he wants to tell someone, and despite her lofty position, she’s ultimately a rather redundant character). As with Jaws, there are requisite starters before the main course (the crew of a trawler are butchered by Blake and his men). Supernatural portents appear (Stevie, the local DJ, hears admonitions of revenge and sees “6 must die” on a piece of driftwood – one wonders if Carpenter was inspired by The Warriors in having her running commentary/ broadcast on events). And the fog rolls in. The biggest star of a John Carpenter film is John Carpenter, hence his name before the title. Or is it? The biggest star of The Fog is actually Dean Cundey. Carpenter selects the anamorphic format and favours the steadicam, but it’s Cundey’s photography that ensures the picture lingers in the memory. Any shot featuring the inexorable fog is an instant keeper, but it’s with the crew of the Elizabeth Dane that the DP really comes into his own: backlit figures with glowing eyes, hooks at the ready – if the movie was as good as its publicity shots, it would be an all-timer. The shot of Blake in the church at the climax is a masterpiece (effects supremo Rob Bottin played Blake, but you’d be forgiven for thinking it was the following year’s Snake Plissken, given the hair). While Cundey went on to work with both Zemeckis and Spielberg, it’s safe to say that neither he nor Carpenter were ever quite as effective after they split. Another issue with The Fog, despite its slender running time, is focus; Carpenter and producer Debra Hill (they co-wrote the screenplay) know where they want to get to, but this requires a lot of wheel spinning en route. Barbeau succeeds in convincing you that she's making the right choice spreading the word to the townsfolk rather than going after her son, but the picture would lose nothing at all by excluding Curtis (she doesn’t even get screen time, or scream time, with her mum), who was so fundamental to Halloween, and would probably gain a bit of credibility, since no sooner has Elizabeth thumbed a lift from Nick Castle (Tom Atkins) than she’s in the sack with a guy twice her age. One wonders if Castle was the part offered to Kurt Russell; he at least wouldn’t have seemed slightly creepy. Atkins bears resemblance a rather dull version of Nick Nolte (there was a certain look of bland leading men with mullets around that time, see also Christopher Stone in The Howling), and Carpenter missed a trick by failing to pull a gender reversal of Psycho and slaughtering him at the end of the opening act. As far as tricks go, Blake’s decision not to kill Father Malone in the church makes no more sense for Malone pondering aloud why he didn’t. The answer’s obvious, of course – so Carpenter can produce a shock ending out of his hat (although, by this point, he and Brian De Palma had collectively managed to make the cliffhanger twist the new norm). It was a mistake to add shots of the wormy faces in the rooftop attack on Stevie (along with the impalements, influenced by the more graphic trend of the likes of Cronenberg’s Scanners). Without them, the force is much more elusive and impressive. Nevertheless, while The Fog doesn’t have terribly good characters, or plot, and even the score is more The Exorcist than typical Carpenter, it does come armed with a clutch of decent tropes. You can go a long way with a clutch of tropes.